Located in the city centre, in the heart of historic Little India, we're close to everything which a backpacker could possibly need - bus stations, MRT (subway) stations, cheap eats, supermarkets, money changers, ATMs, post office, places of interest, etc. We're also the only hostel in Singapore to be appointed an official Singapore Visitor Centre by the Tourism Board. You can be sure we know our stuff! We understand the needs of budget travelers and are here to help you save $$$. At our hostel, you enjoy free breakfast, free lockers, free internet access, and free guided tours. Come join us on our Free Kick Scooter Tours of the city... and if weather permits, our island-hopping tours on our very own boat! 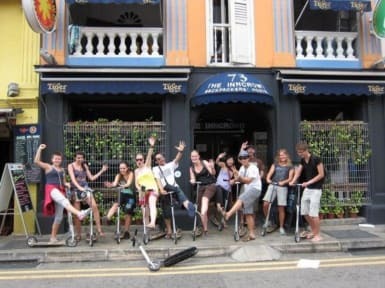 We offer DISCOUNT tickets to various attractions in Singapore (e.g. Universal Studios, SEA Aquarium, Zoo, Night Safari, River Safari, etc). We also serve the cheapest cold beer in the entire Singapore (ah...the privileges of our guests)! After walking around the whole day, kick back with a cold beer, curl up on our couch with a good book, veg out in front of the tv, or have a laugh with friends you make at the hostel. Whether you're a virgin or seasoned traveler, you'll find the backpacker atmosphere here simply unbeatable!